What a darling card! SO glad you've found us--this is only our 2nd challenge and we'd be honored to see you each week! Thanks for joining us at 52CCT!!! Beautiful card. I love the colours and the punched borders. Gorgeous image and layout. I love the colours, borders and of course that cute PB image! THAT is too stinkin cute! Gorgeous card Sylvie....love this little stamp..
Beautiful Sylvie! You'll be very well prepared for Christmas this year! oh what a beautiful card Sylvie! Just love that sweet image and I have to say I think that is obe of my favourite sentiments too! Such a fabulous card! I love this image and the stars are perfect! I'm very jealous of the backdrop to your cards! ;-) Thanks for CASE-ing my card for this weeks Penny Black Saturday challenge! 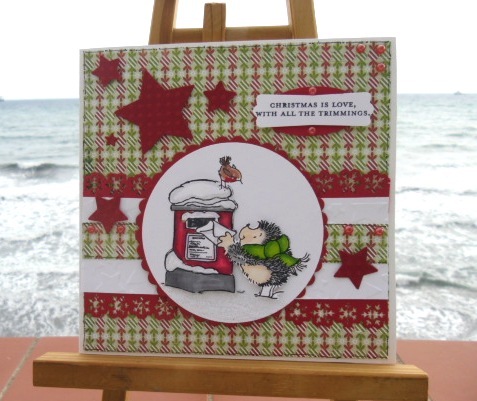 This is just as cute as it can be - I love Penny Black stamps!